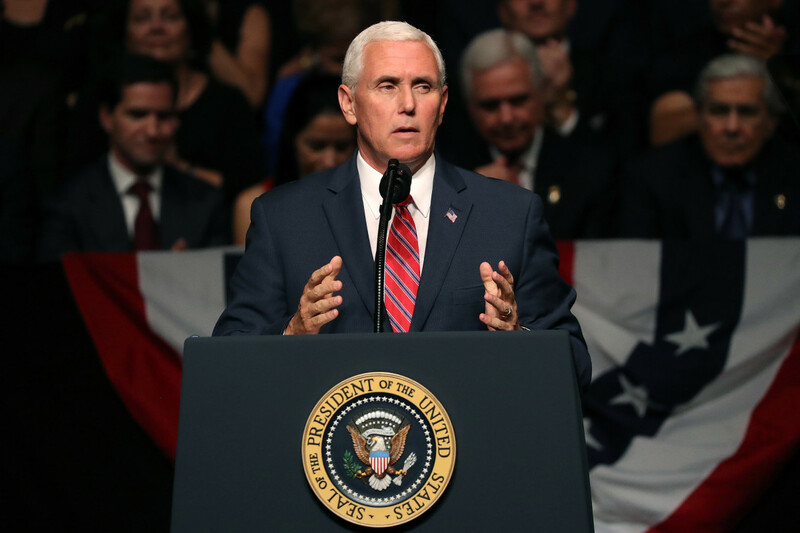 Vice President Mike Pence, seen here speaking in Miami, Florida, on June 16th, 2017. On the last Monday in June, an Illinois woman named Christine Chalkey, the founder of Developmental Disabilities in Illinois (DDiIL), went with her son Jake to meet with a small group of people in Vice President Mike Pence&apos;s office in the Eisenhower Executive Office Building. 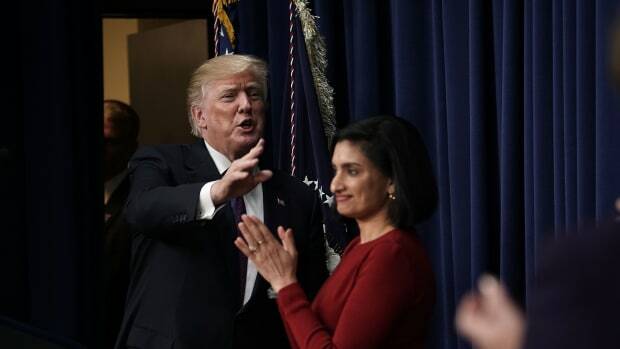 Chalkey shared pictures of the meeting over social media and with local news, showing the gathering of advocates talking with Pence, Kellyanne Conway, and Seema Verma (administrator of the Centers for Medicare and Medicaid Services). The room is mostly filled with white people, but it was at least a momentary relief to see photographs of the administration reaching out to people who would be directly affected by proposed cuts to Medicaid. Then I clicked over to the DDiIL Facebook page and found meme after meme blaming Obamacare and "able-bodied criminal illegal aliens" for every problem faced by "good" disabled Americans. These are falsehoods, and the GOP hopes that such racist claims will get them enough support to destroy the Affordable Care Act. Following the July 4th recess, opponents of Trumpcare are feeling energized. 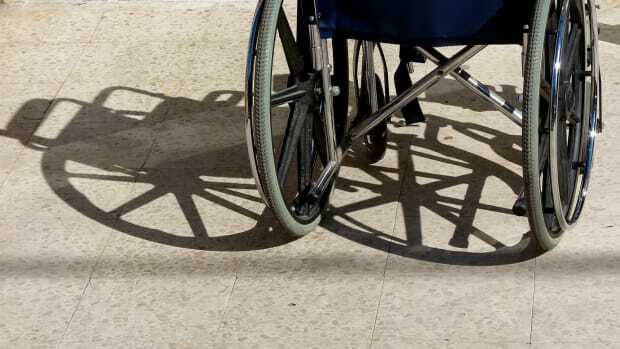 The bill in the Senate was postponed, images of disabled activists from ADAPT are proliferating across the front pages of newspapers, and poignant personal stories about the importance of health care are going viral. 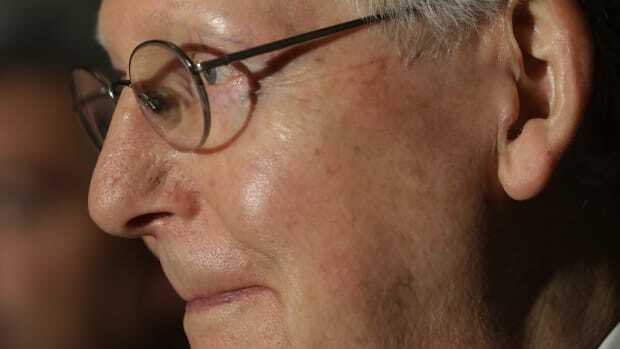 As news breaks that Senator Mitch McConnell is postponing the August recess in order to get a bill done, it&apos;s clear that it&apos;s way too soon to declare access to health care and Medicaid safe. The GOP has a well-tested playbook for just this situation: Play vulnerable groups off each other and convince folks to blame "others" for using "your" government benefits. The memes on Chalkey&apos;s page are just a symptom of a much bigger effort to divide and conquer. There&apos;s obviously nothing wrong with Pence meeting with Republicans who have disabilities, or with their families. They should be meeting—but not if it&apos;s a session intended only to support a White House culture of xenophobia and falsehoods about Medicaid. Here&apos;s what I found on the DDiIL page. In March of 2016, the DDiIL page shifted from fairly generic pro-disability messaging to a more specific and sinister narrative. The page administrator created a meme over a smiling photograph of Jake with a text reading: "Who is hurt by illegal immigration? Illinois Medicaid CUT 1,000 disabled sick KIDS and KEPT 55,000 ILLEGAL ALIENS." The group has used this language in several other memes, including one about waiting lists in Washington state. In February of 2017, the page invited other parents to a "citizens first" rally, again blaming "illegal aliens" for claiming Medicaid benefits. In May, the organization commented on a class-action lawsuit over health care in Illinois prisons, expressing that "they [it&apos;s not clear who she means] are more concerned about robbers, murderers and rapists ... than our [sic] the neediest of our society?" In another post on her personal page, Chalkey wrote, "OK--GOOD NEWS AND THE TRUTH is Donald J. Trump IS KEEPING HIS PROMISE TO NOT CUT MEDICAID. The TRUTH IS he is downsizing the able bodied placed into Medicaid by Obamacare expansion and giving them Health Care Tax Credits to buy government health care, thus actually saving Medicaid for the truly most vulnerable it was intended for, [the] disabled." Attempts to reach someone from the DDiIL over several weeks via both phone and email were unsuccessful. The spokesperson from the ACL would not comment on the "able-bodied criminal illegal alien" statements. None of these accusations, about the causes behind waiting lists, is accurate. 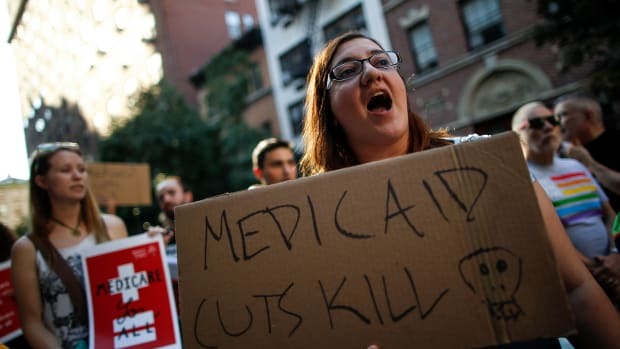 Undocumented immigrants generally have access to Medicaid only when they go to emergency rooms; hospitals treat anyone who requests care and can seek reimbursement from Medicaid for unpaid costs. As a basic matter of public-health policy, we actually want people with injuries, serious illness, or those giving birth to go to hospitals regardless of whether they have health insurance or identity documents. Hospitals, especially rural ones, in fact depend on Medicaid expansion to stay open. The Chalkey family is from Streator, Illinois, where citizens have struggled to keep their hospital. The use of emergency rooms by undocumented people is not a crisis. 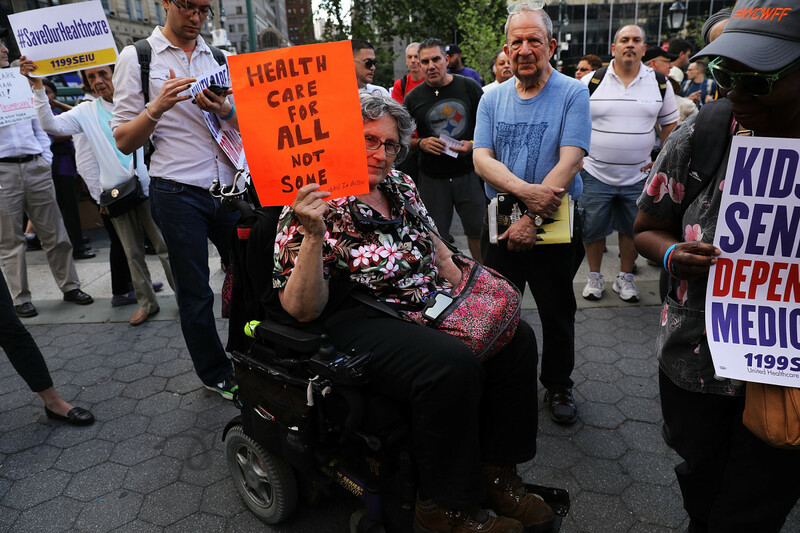 Jean Ryan from Disabled in Action joins others in protesting against the Senate health-care bill in New York City on June 28th, 2017. There&apos;s also no connection between growing waiting lists and Medicaid expansion under the Affordable Care Act. The expansion of Medicaid to include more Americans has been a broad success, rather than a hindrance. 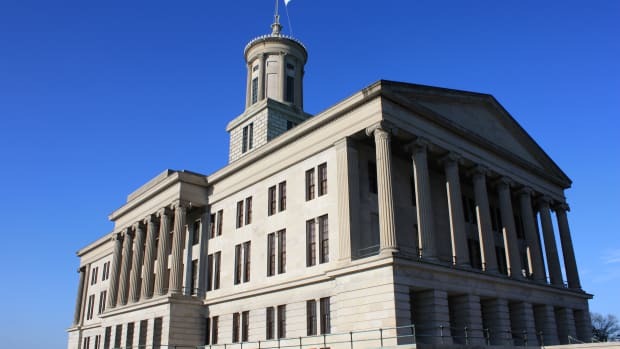 In February, the Kaiser Family Foundation published an analysis of 108 studies on Medicaid expansion, finding widespread positive outcomes for both health and economic well-being, as well as positive signs for long-term reductions in mortality. Moreover, as Ari Ne&apos;eman detailed for Vox, expansion has not increased waiting lists. Ne&apos;eman tells me that the two states with the longest waiting lists, Florida and Texas, have both rejected Medicaid expansion. "The majority of Medicaid expansion states saw no waiting list or a decrease in waiting lists from 2014 to 2015," Ne&apos;eman says, "while the majority of states that rejected expansion saw their waiting lists grow." The challenge is not that the Chalkey family is coming to D.C. to spread misinformation about Medicaid, but rather that the White House, along with the Republican Party more broadly, is spreading that misinformation to households and communities across the nation. The accusation that undocumented people are misusing entitlements was popular during the George W. Bush administration (and has been part of civic life since decades before). More recently, disgraced former Speaker of the House Tom Delay made headlines in 2016 when he blamed "illegal aliens" for siphoning Medicaid benefits. As we&apos;ve covered at Pacific Standard, House Majority Leader Kevin McCarthy likes to talk about a disabled girl named Skylar who is on a waiting list because lazy, able-bodied folks on Medicaid are taking her benefits. Worst of all, such rhetoric continues to come from the very top. Donald Trump&apos;s first television advertisement in his presidential campaign blamed undocumented immigrants for collecting Social Security. His message in that ad, which was based on false information, was that he would save Social Security by booting off the undeserving and illegal from the rolls. Now he&apos;s making the same assurances for Medicaid. He&apos;s wrong this time too. But there are still waiting lists. For those who need services, these waiting lists can cause enormous financial and emotional stress, and even lead to medical crises. When vulnerable people feel they are stuck in a zero-sum game, in which gains for one group signify losses for another, it&apos;s easy for this divide-and-conquer strategy to find purchase, and for pre-existing bias to turn disabled Americans against the very policies that have been working. Because Medicaid works. Medicaid expansion helped. Medicaid needs more support. Instead, the Republican Party wants to gut Medicaid to fund tax cuts for the wealthiest Americans, and they think they can get away with it by telling divisive nasty lies. Odds are, they&apos;re right. UPDATE—July 15, 2017: This story has been updated to reflect the proper spelling of Andraéa LaVant&apos;s first name.